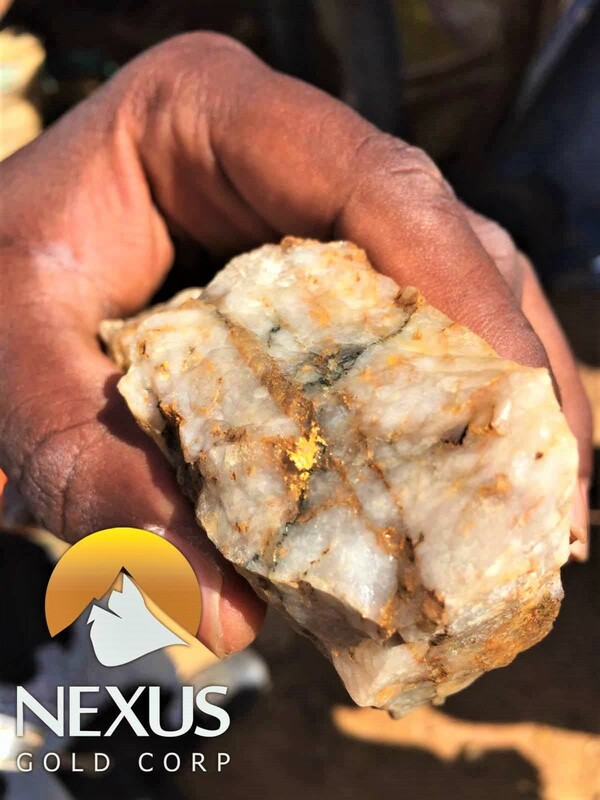 VANCOUVER, CA / ACCESSWIRE / January 8, 2019 / Nexus Gold Corp. (''Nexus'' or the ''Company'') (TSX-V: NXS, OTC PINK: NXXGF, FSE: N6E) is pleased to report initial sampling results from the recently acquired, 100% -owned, 98-sq km Dakouli 2 Gold Project, located on the Boromo-Goren Greenstone Belt, central Burkina Faso, West Africa. Ground reconnaissance conducted recently by the Company to the West and South of the main orpaillage (artisanal zone) identified new near surface workings currently being exploited by artisanal miners. Rock samples collected from these new zones have returned assays up to 29.5 grams-per-tonne (''g/t'') gold (''Au'') with several containing various concentrations of visible gold, including coarse nuggety samples (see Figures 1 and 2). A total of 12 samples were taken from the Northeast Zone. Six of the 12 returned significant grades, with values between 2.90 g/t Au and 29.5 g/t Au (see Table 1), including 27.5 g/t Au and 12.4 g/t Au from samples containing visible gold. The remaining six samples returned values from 0.005 to .192 g/t Au. Samples taken at the Northeast Zone were obtained between 8-18 meters below surface from artisanal shafts and pits. ''The size of the workings and the coarse nature of the gold we have seen from the property so far makes this a very exciting prospect,'' said Vice President of Exploration, Warren Robb, P.Geo.'' These orpaillages were first identified only a year ago and have now expanded to two areas of workings, given the coarse visible gold observed here it is not surprising,'' continued Mr. Robb. ''The initial results from our early exploration activity at Dakouli are very encouraging,'' said Alex Klenman, president & CEO. ''We have already identified multiple zones of mineralization and have recovered some significant high-grade samples. 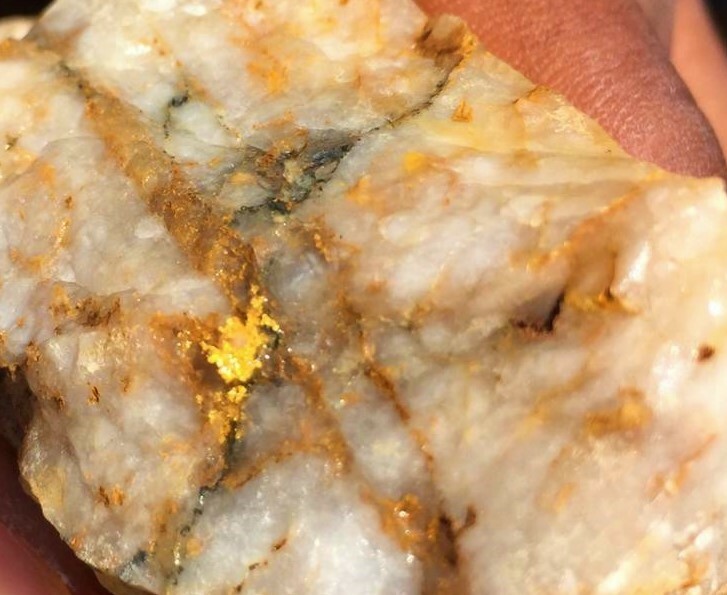 The abundance of visible gold observed and recovered is certainly compelling. We will continue to conduct ground work in the near term and gather needed data as we move towards a maiden drill program in the coming months,'' continued Mr. Klenman. 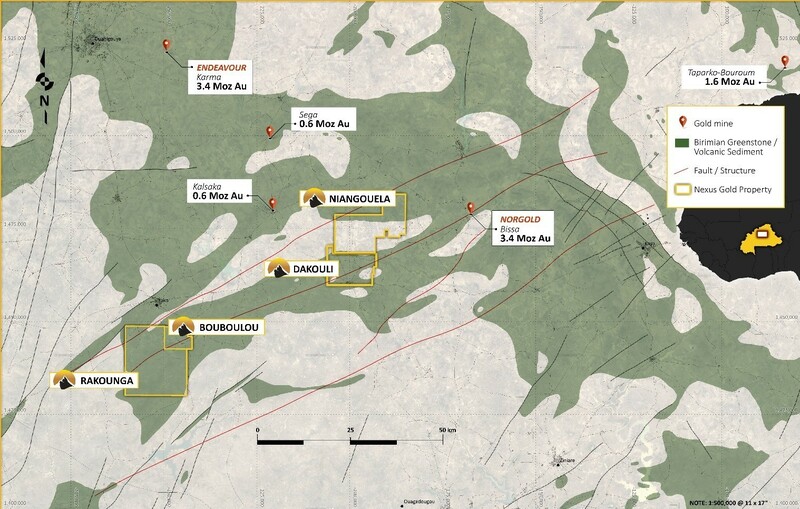 The Dakouli 2 exploration permit is located approximately 100 kilometers due north of the capital city, Ouagadougou. The permit lies immediately South of and contiguous to the Niangouela concession, which has been explored by the Company over the past two years. Drilling at Niangouela has returned significant intercepts, including 26.69 g/t Au over 4.85m, including 132 g/t Au over 1m, and 4 g/t Au over 6m, including 20.5 g/t Au over 1m (see the Company news releases dated March 7, 2017 and April 5, 2017). The Dakouli 2 property is located on the Boromo-Goren Greenstone belt and is bordered to the North by granitic rocks. It is also bisected by the Sabce Shear (see Figure 3) a major structural fault zone proximal to multiple gold deposits, which trends southwest northeast and bisects the entire long axis of the property. 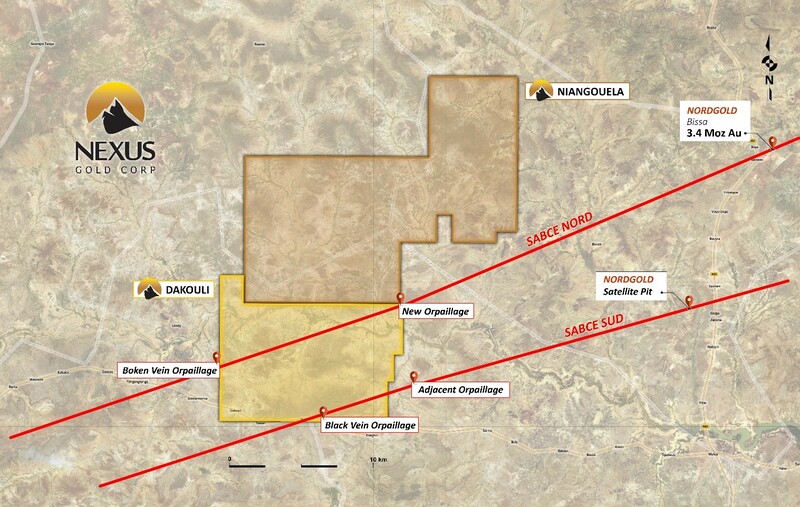 The Sabce Nord trend starts east of the open pits at Nordgold's Bissa mine and continues through the new orpaillage located at the northeast corner of the Dakouli 2 permit, and the southeastern corner of the Niangouela permit (see Figure 4). It proceeds to the Boken Vein Orpaillage on the western boundary of Dakouli 2 extending approximately 12 kilometers across the Dakouli 2 property. The Sabce Sud trend appears to span approximately four kilometers across the southern section of Dakouli 2, and includes the Black Vein Orpaillage, a series of deep shafts that trend sub parallel to the Sabce Sud trend. The Black Vein Orpaillage features abundant black quartz vein, similar to what is found at Nordgold's satellite pit located approximately 20km to the east.